I've updated to the latest post editor on Blogger and now I can upload photos through the proxy! 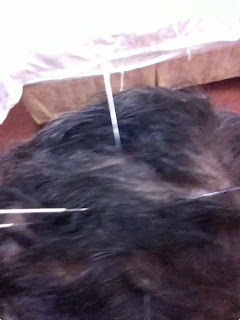 First up, I thought I'd share some pics of the acupuncture I've been receiving. The needles in the right hand make it hard to move my hand and fingers. You'll notice the needles are in all the way to the bottom of the grip about 3" deep. None of these pictured really hurt -- at least not as bad as you'd think ;). Many times I can just feel the pressure of the needle as it comes up against bone or membrane. Rarely is there a cross with a nerve -- occasionally there is a sting when it first breaks the skin, but that's maybe one or two per treatment. Then there is the tongue, lots of light jabs then two pokes on top and one stick under the tongue. Time to go make dinner, next time I'll share some interesting pictures of the food. Apologies for lack of posts in the last week. I've been mostly working on a super-secret project that I'm very excited about (more about that in a bit). I also finally received my care package on Sunday -- which contained many items that have also kept me busy. I started to work on a post yesterday but developed a nasty headache before lunch that hung on until 1am. I believe I experienced my first 'Herx" reaction. Named after Karl Herxheimers, the Dr that observed patients reactions when excess toxins are released faster than the body can remove them. My care package included all of my supplements -- which I have not been taking for over 2 weeks. Some of the supplements serve as natural antibiotics which kill bacteria that may be part of what started my symptoms. I didn't realize it yesterday -- I just felt like crap and tried to deal with the headache and eye pain as best I could. But this morning when I woke up I had a strong toxic smell (I had showered the night before) and my urine was very dark. But I felt much better, more so than I had for the last week or so. I'm gonna say this was a good thing. As to what the bacteria may be is a larger question. I have tested positive for Borreliosis, the bacteria that is linked to Lyme disease. There are estimates that over 80% of those diagnosed with ALS are carrying the Borreliosis bacteria. My plan after returning to the states is to pursue a course of treatment to specifically target the bug, but as I mentioned some of the supplements I'm on are already starting to have an impact. It's good to be here receiving TCM treatments, part of the daily routine includes pulse and tongue diagnosis. So if I am having a toxin overload it can be dealt with immediately. When I talked to the Dr about it this morning she said we'd give it another 2 days. If I have another similar experience she'll change the herb formula. But she agreed it was a good sign that I was detoxing. David and Paula left yesterday, the only other Americans. It was hard to see them go, we had become fast friends and they were very helpful. Unfortunately David left in worse condition than he had arrived. When he came in early December he was able to walk with a cane, when he left he was moving slowly with a walker. The last 2 weeks were particularly hard on him. The power and water issues, as well as the elevator being out of order for a week and all of the construction noise really caused him a lot of stress. I hope he is able to find a path to wellness once he is back home. However, another patient has had some recent success. When she arrived she was using a walker -- and now just over 3 weeks later she is getting around without any assistance at all! We are all very encouraged by this. Hans and I were talking tonight and shared that we are both talking a little better as well. That has been an unexpected joy of being here. The community shares the ups and downs together. We are all experiencing our connectedness as we share the joys and pains of healing our bodies, minds and spirits. It took a few days to recover from back to back trips into town as well as a few nights rough sleep aided by outboard heater units that apparently weren't designed to work covered in ice. It's been snowing steadily for 4 days. For my Minneapolis peeps that seems like not such a big deal but it's like saying it has been snowing for 4 days in Seattle. They are neither accustom or equipped for it. Traffic (which in a normal state is complete chaos) is an e-ticket ride. No plows to speak of, and they are using spades to shovel the walks. It's been a good time to rest and be lazy in the room. Actually fired up the TV for the first time. 30 channels of pure Chinese culture and language and one channel of state run English speaking news. Kind of a mix between CNN and BBC. Not sure how obvious it is in the states, but Chinese President Hu Jintao is visiting President Obama -- the commentary news is interesting from here. Apparently America should stop trying to "surround" China through it's allied relations with Japan, Korea and Russia and we really need to open up our markets to more Chinese exports -- as well as start selling the Blackhawk helicopter to demonstrate our true commitment to Sino partnership. We also need to stop harping on the human rights issues. Didn't need more than about an hour of that propaganda. I also watched a few of the movies I brought including Crouching Tiger, Hidden Dragon -- it had been a few years. What an excellent movie. Great sword play and skilled horse riding, a beautiful soundtrack and a touching story. When I saw it in the theater it was with English subtitles. This time was English dubbed. I have to say I understood a lot more of the story this time, and was able to really enjoy the cinematography. Caught up on laundry and made a giant pot of mutton stew with dal and a ton of veggies. Ate it over 3 days... very tasty. I did finally manage to make it into town today, and wondered a bit farther from the mall. Still looking for a florist for some flowers for my stark white room. No luck there but I did find a pharmacy. Of course nothing was labeled in English, but the staff had a good time following me around and giggling while we pointed at things and I tried to use various Eng->Mandarin tools on my iPod to locate fish oil and calcium. I found them both as well as Spirulina and powdered goats milk. Like at the grocery store, whenever you pull something off the shelf, someone immediately hands you a different brand of the same thing -- or occasionally something that seems completely different. I'm not totally clear if they are showing me better quality, better price, or if they get a spiff for pushing certain brands. Half of the pharmacy looked like a drug store, the other half had traditional chinese herbs including some more exotic items like dried lizard and hippocampus. I was tempted to buy both -- but couldn't picture how I'd get them back to the states in once piece. Going to have to research what the seahorses are good for. 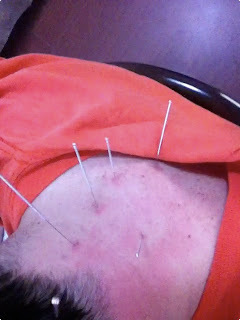 Today was also a change in the acupuncture routine. Instead of the top of head, back of neck, jaw and right arm -- it was 5 in the stomach and one on the side of each knee. I was glad for the change, I had started to build up some scar tissue, especially behind the jaw that was getting painful when I chewed. I believe we are "stoking the fire" with the stomach work. 3 days of that and then we'll get back to concentrating on the throat and right arm. My speech is still pretty labored, but my swallowing is completely back to normal and I can tell I have more power in the tongue when I'm eating. I also feel like my right hand has filled out a bit. We had a new arrival today, Tracy from Seattle! She is here only for a week and is studying at the TCM school here. She's been traveling for several months through Europe and Thailand and stopped here on her way home to check things out. Her plan is to return later in the year for more training and possibly to teach ESL. It was great to talk with another American, especially someone from Seattle (Bothel). Paula and David, the only other Americans are getting quite short -- they leave for home on Tuesday. I'm going to miss them, it has been great to get to know the two of them. We've commiserated through some of the challenges and their veteran advise has been invaluable. Tomorrow we hit the 1/3rd mark for my planned time here. Seems like time has passed by very quickly, wonder if it will feel like that at 2/3rds? We also had a full day (Sunday) with no power. We were warned in advance -- it was due to construction in the area, and the staff did what they could to make things bearable. It went off at 6:45am and since the heat is electric, the first priority was warmth. Dozens of rubber water bottles were filled and distributed as well as extra blankets and an open fire "pit" was lit on the first floor. They also offered the distraction of leaving the facility for the day -- I was initially not going to go, but decided at the last minute that my spirits would probably do better by going out. We were taken to a park, it was nice -- more cement than greenery, but given the time of year there wouldn't be much green anyway. There were 3 traditional pagoda style buildings, one was at least 20 stories tall and very ornate. The "Peoples Park" was along a river and there were gardens and paths with groomed trees and bushes. There was an interesting walkway across the river. 50 or so 2x2 square stones came up out of the water in pairs, each spaced about a foot apart. One side was about 8 inches taller than the other. They allowed you to walk across the river with sure footing, but there was no rail. Waking across was really more of stepping one foot and then the other on each stone. You could take a longer stride and hit each stone with only one foot -- but a slight trip and you'd be in the river. An interesting experience, not terribly practical as there is no way for river traffic to pass. We didn't stay very long as there was a decent wind and it was pretty chilly. The bus then took us to the New Life Mall -- the same building that houses the supermarket where we shop for groceries 3 days a week. Normally we don't have enough time to shop for groceries and see the rest of the mall, so it was interesting looking around. We had lunch together at a large restaurant where all of the various dishes were sitting out, you selected what you wanted, it was written on a card and brought to you after being prepared fresh. There was a wide selection, lots of veggies, and of course many things I've never seen before. I settled on a seafood dish with small squid, shrimp, clams and sausage stuffed mushrooms. It was served on an elevated tray with a sterno fire going underneath. It was pretty tasty and a nice change from what I've been eating. I shared the table with 3 other men, Emilio from Barcelona who had been at the clinic since early December and Hans and his son Gerhardt from Austria who had just arrived the day before. Emilio has atrophy in both arms -- but said his condition had improved during his stay. Hans had muscle loss in his tongue and throat as well as all of his limbs. Both were very positive and had a great outlook on their lives and general health. We laughed a lot and shared stories of our careers and diagnosis and progression of symptoms. It was the best connection I've had yet with other men on the same journey. We spilt up after a long casual meal and I wondered around the 5 floors of the mall. It was really more of a large department store than a mall, each floor dedicated to certain goods -- ladies, men and childrens clothes, household goods and electronics. Of course I spent an hour or so looking over the various gadgets. Lots of hand-held MP4 video players, some very cheap netbooks (sub $100), digital cameras and remote control toys. I spent a little time considering a remote control helicopter, but I know that it would be fun for a day or so until it broke -- then I would be stuck with yet another piece of broken tech that I would eventually toss. But they were cool looking :). The day before we had come into town as part of our regular schedule and went to an open air market instead of the mall. I'll save the details of the market for another post -- but between the two days of walking around I was pretty beat. When we got back to the clinic we started cooking dinner (gas stoves fortunately) and only had to wait a few hours before the power was back on. There was a big cheer when the lights came on -- amazing how things you normally take for granted are celebrated when they return to their normal state of being. Treatment came at 7pm, with the massage ending around 8:30 -- I collapsed into bed. It's Saturday, I arrived at the clinic a week ago. Daily treatments go easy and are welcome. Acupuncture now includes needle "pounding" the jaw, alternating each side daily and tongue stabbing. Mmmmm, stabby. It's really not as bad as it sounds. The hardest thing is keeping my tongue stuck out for longer than 10 seconds. 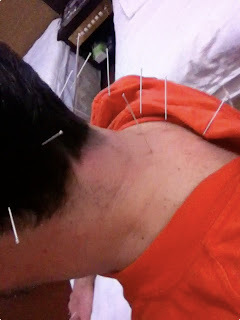 Like most needling (with the above exception) it is generally just an unfamiliar sensation, with the anticipation of pain -- and when it moves to uncomfortable that anticipation is amped. The morning routine is getting stronger -- and helping. This morning I woke up and felt like lying in bed until the 9am rounds, but discipline is the mother of movement through the moment. Just had to get started -- light the candle, start to pray and soon I was singing the loudest chakra mantras yet! Then, I read the emails and comments from so many of you -- and I cried, and laughed. They provide an additional source of strength to keep at it. So, at this point in time, 1/6th of the way through -- would I recommend others diagnosed with ALS to come? TCM expertise -- these folks live it, and have specialized in the treatment of ALS and other neuro disorders. Isolation which provides an opportunity for focus and intention. Community which provides empathy and hope. Food is foreign, and not just because it's hard to find cows milk, or meat you can trust, or pizza. When you are on a restricted diet (as most of us have moved to) not having access to various gluten-free / organic items, or knowing what ingredients are in the various sauces (hard to read labels when they are in Chinese) -- your diet becomes even more restrictive by necessity. Not knowing the language, makes you illiterate, and to some extent deaf and mute. Lots of pointing and grunting and frustration as you try to communicate. Yes there are translators, but much of the information is lost in translation or simply not translated at all. China is rushing into the 21st century. The clinic is modern, as is the supermarket -- but all around there are people living in conditions that are considered by many westerners as primitive. The roads are dirty, the air can be thick with coal and diesel smoke and germ killing cleaners aren't as common as one may be accustomed to. You aren't home with friends and family. If you can find the expertise in herbs, acupuncture and massage close to home -- you may be better served to not subject yourself to the long flight, the stress of communication and limited access to the type of nutrition and amenities you are used to. However, if you have the resources and the strength (and even better have someone who can make the journey with you), and access to TCM is too scarce or too expensive at home, by all means consider this a viable option. My body is stronger and more in balance everyday. Is it a cure? No. But it does give my body the best fighting chance to slow, stop or even regress the symptoms of this horrible disease. Yes there's a room full of people in your head, in your head. And every single one of them knows your name. So goes the song by Craig Minoa of Cloud Cult. Woke this morning with the critic on the mic. I'm not doing enough, just going through the motions, checking things off my list so at some point I can turn back to God, or my Doctors or anyone else and scream "IT'S NOT MY FAULT!!! -- SEE LOOK, I DID EVERYTHING I COULD..."
Screaming, more of that. I grabbed a pillow on Sunday and screamed for about 30 seconds - everything felt better, and my voice dropped. No water for most of the day today. Dr Ming is visibly upset, but something that is obviously not in his control. Talking with others about it, this is not common but not unheard of. So we all pitched in and boiled water in the kitchen for dishes (we still have a hot/cold water cooler in the room, so plenty to drink). I was planning on a shower and laundry today -- best laid plans. Tremors are high today and all over my body. Nothing uncomfortable, and no cramping -- I like to think it is a good thing. The muscles are "beaconing" to the neurons for signal. Healthy neurons can take the place of those that have become too weak to signal -- with the potential to expand by a factor of 5! Cooking my own meals today -- and glad for it. Nothing tastes as good as your own food. The morning routine is pretty much set. If I'm up by 6 I get through it all by 9 in time for the Doctor's rounds. Then tea, a little video chat with my sweet wife and daughter and acupuncture and massage takes me to almost 1. Making, eating and cleaning up lunch takes about 2 hours -- a nap, exercise, a little computer time and then dinner. Meals are a social time -- hanging out cooking in the kitchen with everyone else is enjoyable. So far everyone I've met is here for ALS treatment. After dinner and cleanup another video chat, and if I have the energy some reading or computer time. Hard to believe I used to work 10 hours a day. Thanks for all the comments and emails. It helps to hear from you and stay connected. Until tomorrow -- love from China. Was woken @ 1:30 by fireworks -- apparently a common occurrence no mater what time of year. Unfortunately it hit me wrong in my sleep cycle so I was up till about 3:30. Up @ 6:30 for the morning routine, now complete with tongue exercises! As part of the team rounds they put me on a heart monitor. The suction cups didn't want to stick because of the hair on my chest, so I've finally succumbed to a bare chest. Looks kind of ridiculous to me, and it shocked M&G when I lifted my shirt on our video chat. 2 eggs for breakfast along w noodle soup, this should be a real test for the allergies. Even more needles with Tom and then beef w cumin, steamed veggies and rice. Then off to the market! giver. Atusa from Innsbrooke, Austria is here with her mother. Turns out that Atusa studied TCM under Dr Ming 10 years ago. She had great things to say about him and his work as both a healer and a master. Paula here with her son David from Vermont and Tarida and Osama, both here with family members -- all being treated for ALS. The ride took us through a much more modern part of the city than the ride from the airport. With only 6 million people, Huaihua is considered a "small" Chinese city. Much more crowded than Shanghai, lots of traffic -- from scooters to busses and trucks all weaving and honking and waving. No road rage, just getting along in very tight and fairly unstructured ways. The supermarket was overwhelming. The translators were there to help, as was Atusa -- for which I am very grateful. I managed to find most everything I was looking for, and lots of stuff I've never seen in my life. I'll probably go back on Saturday to do some clothes shopping. None of my jeans fit anymore, and the prices are pretty amazing. Everyone is dressed nice in new clothes, and I can see why. Need to keep this one short, I'm pretty tired between the short night, no nap and the trip into town. Sorry about the double posting, didn't hit publish on Day 1 yesterday. Woke at 6:30 after 10 hours of sleep. Meditation, mantra and QiGong all before 7:30 the official wake time, which felt great. I'm using the "Waking the Cobra" seed mantras for meditation as well as Om Namah Shiviya using a full mala. The whole thing takes about 45 minutes and all out loud. The walls are a little thin here, and my voice has a drone to it anyway -- I'm sure some of the staff wonder just what is going on in my room. But, I have to get over being concerned about that -- not here to impress anyone. Breakfast arrived at 8:30, noodle soup and veggies again w/ egg. Not so sure the egg is a good long-term plan, I recently tested with a moderate allergy to eggs so I've been avoiding them. But, the breakfast menu is pretty limited and eggs are the only protein and high protein is the priority. Hopefully I'll be able to find some protein powder when I go to the market tomorrow. Daily round with the team @ 9. The professor wants me to start taking calcium supplements as well as do tongue exercises to combat the atrophy. Did some shopping on Amazon, looking for a good acupuncture book to help me log the points being used as well as a book on Chinese history and culture. Found a number of free kindle books on Chinese history and a sampled a few good acupuncture books. I love the kindle store -- you can sample a book in the reader, and many of the samples are dozens of pages. Herbs showed up @ 10am just as I was saying goodnight via video chat w/ Margit and Grace. 11 brought Tom for acupuncture and tui-na massage. More needles today than yesterday; 5 on top of the skull, 7 in the back of the neck, 1 deep in the upper back (3 inches), 6 down the right arm one in the left and two in the right foot, and my favorite, one under the chin. They are concentrating most of the work on voice and tongue to start. Nothing really painful, but not exactly comfortable -- especially when I swallow. 30 minutes later the needles come out and then it's another 30 minutes of massage. Medium to deep tissue work, mostly head, shoulders, neck and arms. Nap from 1-2:30 then studying and logging the points used. While studying I learned that moving while having the needles in is recommended, especially for ALS. So tomorrow I'll see how that feels. Certainly not the most intuitive thing to do given the depth of some of the needles. A little email and Facebook and a failed attempt to video chat with my friend Legend, then it was beef (I hope) and celery, mushroom and corn soup and rice. Again, a tasty meal -- as long as you don't spend too much time thinking about it. Some planning for the trip to market, evening mantra and a good morning video chat with M&G and I was in bed by 9. Woke at 6:00 refreshed and happy to be here. Bed is very firm, apparently my body likes it as I slept well. As I mentioned in my Day 0 post I have my own heater in the room. It's actually a heater / air-conditioner. Very fancy with a remote control -- unfortunately all in Chinese. Since I'm not suppose to run the heater at night I woke to a chilly room, so before getting out of bed I tried turning it on via remote. After about 10 minutes I crawled out from the comforter to find I had turned on the AC! After a few minutes of fiddling I got it to start cranking out heat. Did some QiGong, but did not complete all 8 brocades before breakfast arrived. Noodle soup with and egg and some green tea. The tea turns out to have been a mistake -- it was quite tasty (I'm in China after all) but it really kicked up the tremors. I had mostly stopped drinking caffeinated tea for that reason -- today just confirmed I need to stick with the herbal and flower varieties. After breakfast the daily routine continued with my check in with Dr Krista, Tom, nurse CC and Susan (another translator as John had the day off). I found out that my daily treatment would be scheduled for 11am. This will work well as it gives me a structured morning up until lunch and siesta. Lunch was chicken and celery with steamed veggies and rice. Very tasty. After lunch I tried to print out my list of supplements and my medical records. All together about 50 pages. When I took the documents on a USB stick to the translators office they looked at me like I was crazy. 50 pages seemed like an unreasonable request. While I was waiting, one of the translators was bumping deep house. I think I'll have to connect with him another time ;). Back to my room, freshly cleaned -- started working on a blog post when dinner arrived, a whole fried fish (some kind of white fish), eggplant and of course, steamed rice. No meditation or mantras today, but I will have time to work them into the routine tomorrow morning. I arrived at the Zhongfang Red Cross International Hospital Saturday morning after being picked up by my translator "John" at the Huaihua airport. The drive from the airport was interesting, I took some video and will upload in a future post. We passed very old, old, newer and brand new structures -- all seem to be randomly build next to each other. Lots of trucks and busses on the road, the ever present scooters and motorcycles and the occasional passenger car. Then there are these what look to me to be diesel powered rickshaws. Where instead of a person pulling the cart, there is a two wheeled diesel engine. There were some carts being pulled by people as well, including one by a man wearing a suit! As we approached Zhongfang (20 miles south) 20-30 story buildings started to appear and rows of identical multi-family dwellings like you see in suburbs off the highway in the states. Zhongfang is China's "youngest city" -- celebrating it's 3rd year and from what I saw driving in is one giant construction zone. The hospital is a nice 6 story brick and cement building, the entire front half of the building above the 2nd floor is open with large balconies facing toward the city. Lovely in the spring and summer I'm sure, but makes for a cold building when it's 2 degrees celsius. I was taken to my room, 45 sq meters with it's own bathroom, heater, mini-fridge and water cooler. Two beds, dresser and armoire, one treatment table, a desk, 40" flat panel TV and a few chairs. Comfortable but sparse with tall ceilings and nothing on the white walls except a mirror. Lunch was delivered to my room, a tasty meal of chicken, bok choy and rice. After an hour to myself of eating, unpacking and reading the "Information Guide" I was escorted to a conference room where I met my team: Dr. Ming (center president), Dr. Krista (my assigned doctor), nurse CC, Tom the acupuncture and massage practitioner, translator John and then there was Professor ______. I didn't catch her name, as it was the only one that wasn't westernized (or short) -- but she is definitely the elder of the group. Everyone cued off of her questions as they discussed among themselves in Chinese and asked me questions through John (except for Dr. Ming who is quite competent with English). The team then came back to my room where they spent about 30 minutes reading my pulses, looking at my tongue (two primary diagnostic protocols in TCM) and looking at my right arm where most of the atrophy has occurred. After everyone left the Professor stopped by again (but without a translator) and showed me some paperwork (in Chinese) and said a few things to me (again in Chinese) but had a knowing smile on her face. It seemed to me she was telling me that she was going to manage my case directly -- I did my best to communicate back that I thought I understood. She smiled, nodded and left. Again, I'm not exactly sure what it was all about but I was comforted by her presence and spirit. About an hour later Tom came in (with translator) and I received my first treatment. More details on his technique in the future, but he was confident with his needles and gave a strong and thorough tui-na (medical massage). My herbal tea arrived shortly after the treatment. I drank one bottle and completed unpacking. It was much stronger than what they have had me drinking at home for the last few months -- and they definitely switched up the formula. Now with 20% more pungent tastes! Dinner came an hour or so later, I barely finished because I was so tired. Had a quick IM with Margit then washed up and was in bed by 6:30. Had to set and alarm for midnight so I could take my other bottle of herbal tea. Woke up, drank the tea, crashed until 6:00 am. I woke up feeling rested and happy to be here. Feeling grateful for all of the help received to arrive here and excited about the healing that has already begun. It was a long flight, 12 hours to Tokyo, a few hours layover then a 4 hour flight to Shanghai. It was almost a full 24 hours from departure in Minneapolis to arriving at my hotel. The flight to Tokyo was a large plane and was packed. Since we were flying west it stayed light until just before landing, added to the surrealness of it all. I was impressed by the size of the airport in Shanghai. Easily the most immense complex I've ever seen. Very modern and spacious, the few hundred people at baggage claim seemed small compared to the space. The taxi ride to the hotel also had the same feeling. Lots of well lit roads with very few people traveling. As we got closer to the city center I expected to see a crowded city, but most of the large apartment buildings we passed looked mostly empty and the city seemed asleep. I arrived at the hotel (Ramada Plaza) around 10:30pm local time. Even when I got to my room and looked out the window the city seemed quite and sparse. I complete my travel to the clinic in the morning, should arrive late afternoon. Feeling good, all limbs are functioning well. My speech is slurred and slow, but I'm not talking much so it's not a problem. I have a few apps on my iPad that let me type in English and it will translate to Mandarin, as well as allow others to type or draw Mandarin with translation back. Everyone I have encountered has been very friendly and helpful, a great start to the trip! More from Zhongfang in a day or so!